Tickets are on sale now for $25, https://web.ovationtix.com/trs/pe/9746104. on 11th October 2012 at 5:00 p.m. in the Cinemateque. Edith Kraus is hoping with us that she can be present at the screening. So you may have the possibility to meet her there. Some other participants of the film will be present too. We shall have the honour to introduce them to you. We look forward to this event. In the Film Edith Kraus speaks German, other participants speak English, Hebrew or Russian. There is music played by Edith Kraus in the film! Interestingly, there are several movies that have come out about Jewish songs. One of them is Hava Nagila. Another is Kol Nidre. Another is Hatikvah. Here’s promo for the movie on Hava Nagila. OF SAN FRANCISCO JEWISH FILM FESTIVAL!! The San Francisco Jewish Film Festival (SFJFF), the oldest, biggest and most renowned Jewish film festival in the world, announced that Hava Nagila (The Movie) will be the opening night film of their 2012 festival. The film will premiere July 19 at the Castro Theater with a party after the screening. Thanks to Kol Halev Choir, led by Cantor Annie Rose for sending JMWC a copy of their video of their 2004 Eastern European Tour. 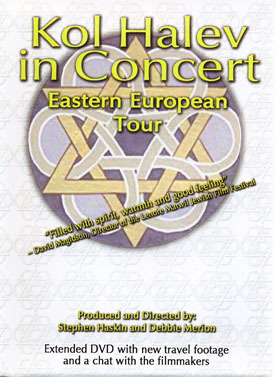 It’s a delightful 16 minute film showing the joy of Jewish community members hearing the choir sing in Yiddish, Hebrew, Ladino, and trying out Bulgarian and Romanian. 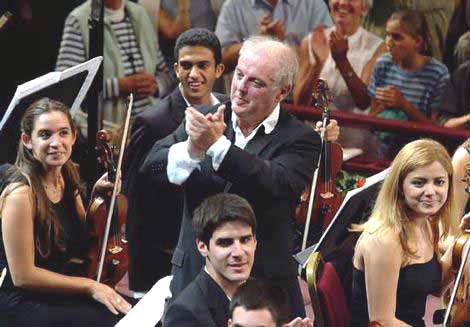 Kol Halev went on a tour of Romania, Bulgaria and Greece singing to very appreciative audiences. The filmmakers share a short chat, also included in the DVD. Kol Halev is also planning to release a DVD of their journey to Argentina. This film shows once again that Jewish music carries in it the seeds of joy, community, memory and bonding. Their website is located at: http://www.kohalevfilms.org. Merlin Shepherd (clarinettes) et Polina Shepherd (piano). running from March 29-April 13. Company, with support from Brandeis University & the Massachusetts Cultural Council. Several film at the Boston Jewish Film Festival this year feature music themes. Ciné – Concert exceptionnel ! à l’Aula du Collège des Colombières, route de St-Loup à Versoix. facilité de parking et d’accès aux personnes handicapées. Thursday, May 12, 2005 at 6 p.m. This concert was videotaped before an invited audience on January 19, 2005 at the Elebash Recital Hall, CUNY Graduate Center. The program includes four world premieres, including a work by composer John Corigliano and librettist William M. Hoffman, written especially for the program, two American premieres and a New York premiere. A nayer dor zingt af yidish! S’iz nor vos aroys der DVD/video PRIPETSHIK SINGS YIDDISH! untern rezhi fun muzik-direktor BINYUMEN SCHAECHTER. Morozov Jewish Film Archive (Kiev). June 27, 2pm. Worth seeing (and the music is good! ).